Трехходовой клапан – это устройство, предназначенное для переключения или смешивания двух разных потоков в один общий поток. Для перенаправления потоков из разных трубопроводов. Для смешивания двух потоков и получения единого. 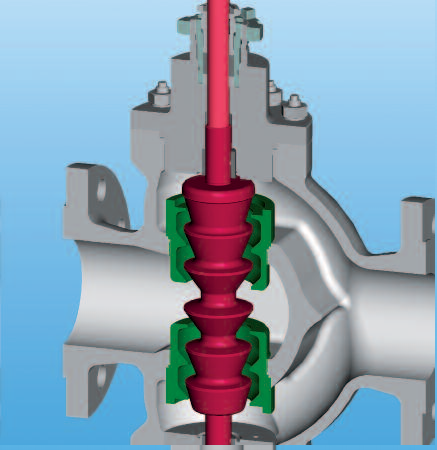 The ARCA three-way control valve is designed to be used as a three-way or mixing valve, depending on the applica-tion. 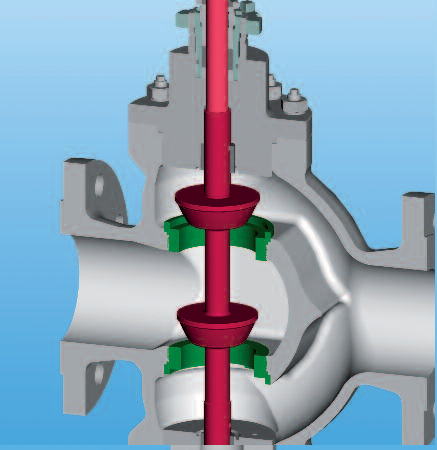 As a three-way valve, the incoming medium is split into two individual flows. This split can be 1:1 or a different ratio can be used. 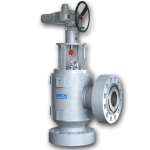 As a mixing valve, two media are mixed in the valve housing and exit the three-way valve in the desired new state. The ARCA double-seat control valve is characterized by its simple and robust design, featuring a double guided trim, and is used for larger volumetric flows. The flow is con-trolled at two ports, whereby both plug diameters are coordinated such that the medium exerts an opening force on the one plug and a closing force on the other and the actuating forces almost compensate each other out as a result. The plugs can take a variety of shapes to meet appli-cation requirements. 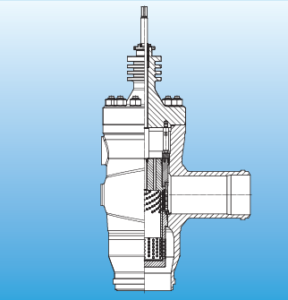 The ARCA angle valve is used in very specific plant appli cations. The ARCA modular parts system therefore integrates housings made from different cast and forged materials so that a wide variety of requirements can be met. The internals, however, always follow the same basic clamped principle of the ECOTROL® series. The process fluid flows into the angle-control valve from the side or the bottom and exits after just one deflection. 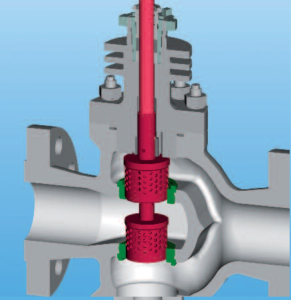 ARCA forged valves are made from a forged block or a dye-forged housing. Defining characteristics is the large selection of housing materials and the resulting increase in structural safety. 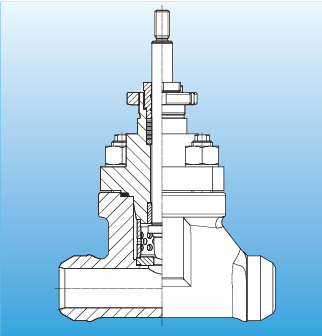 Forged control valves are especially used in conjunction with welded ends, since they can be con-nected directly to the piping here. The internals also follow the basic clamped principle of the ECOTROL® series. 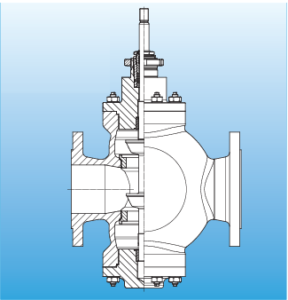 As with all ARCA series, the modular double-seat control valve is available in many ver-sions, meets nominal pressure requirements up to a nominal pressure of 160 bar (PN 160), and is compatible with temperatures to 530 °C. 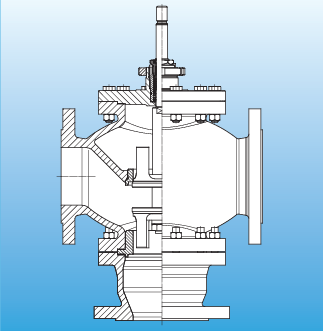 This valve is a high-pressure double-seat control valve that has cooling fins in the bonnet so that the stuffing box remains out-side the hot area. Fluid control takes place via perforated plugs, which are used in place of traditional parabolic plugs to reduce noise. The ARCA modular parts system facilitates a multi-stage pressure drop to accommodate higher differential pressures and applications for which the purity of the medium cannot always be ensured. This version allows you to depressurize the medium without cavita-tion, for example. 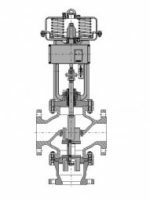 The design of the double-seat control valve eliminates the need for a pressure-relief facility and shall be preferred if the process fluid is slightly contaminated. Small actuators are of course used for the double-seat control valves.